These are the latest additions to our video collection about SUPERBOOTH17. Find all other recordings below. We are delighted to announce two artists that will be playing at SUPERBOOTH18 – Carolina Eyck will be performing with her Theremin and Eden Grey with her modular synthesizer. We are very happy about the return of Eden Grey to SUPERBOOTH18. To get an impression of what to expect, we have added a small portion of her concert from SUPERBOOTH17 to this video. 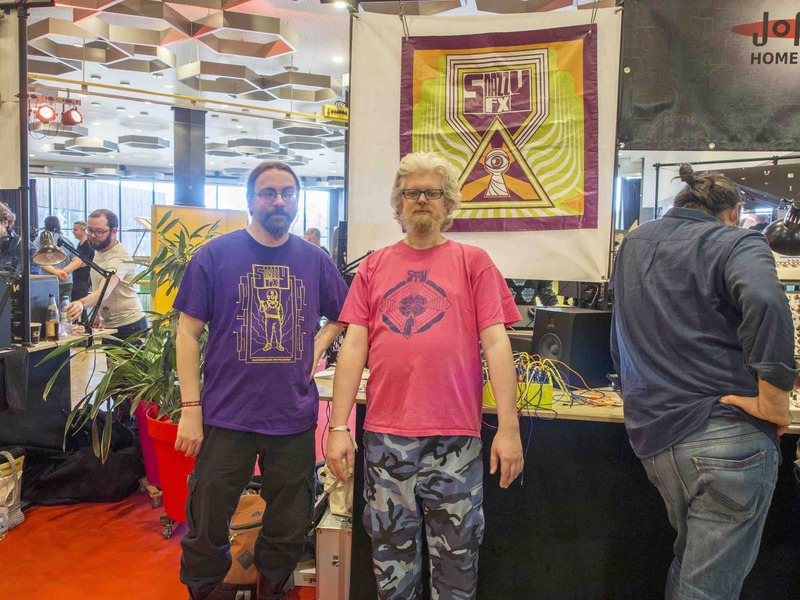 Feld were unusual, but very welcome guests at SUPERBOOTH17. Their energetic music is created in a three-part band with guitar, bass and drums. A very pleasant addition to the Superbooth program. 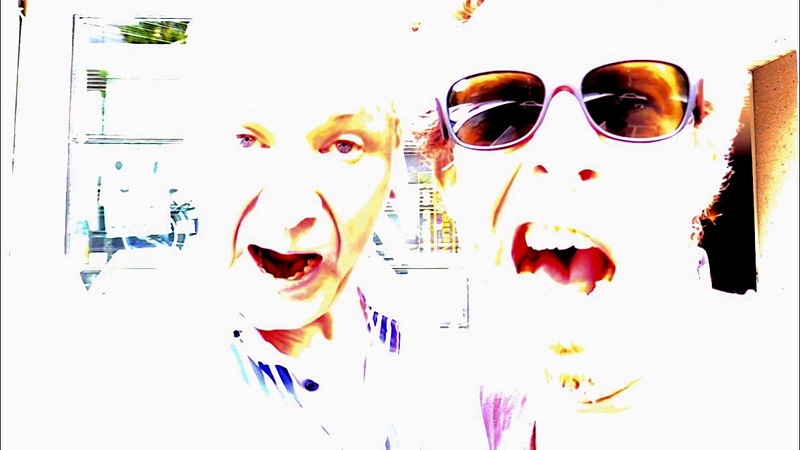 Jan St. Werner and Andi Toma are Mouse on Mars. They have been an influential part of the electronic music scene since the mid-90s and released several albums on different labels since that time. 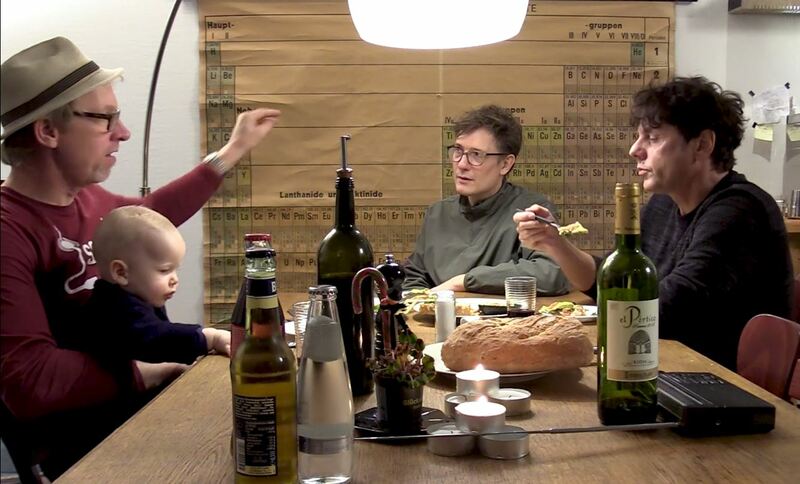 Watch them cook with HerrSchneider and HerrSchneider Jr. in this special video. 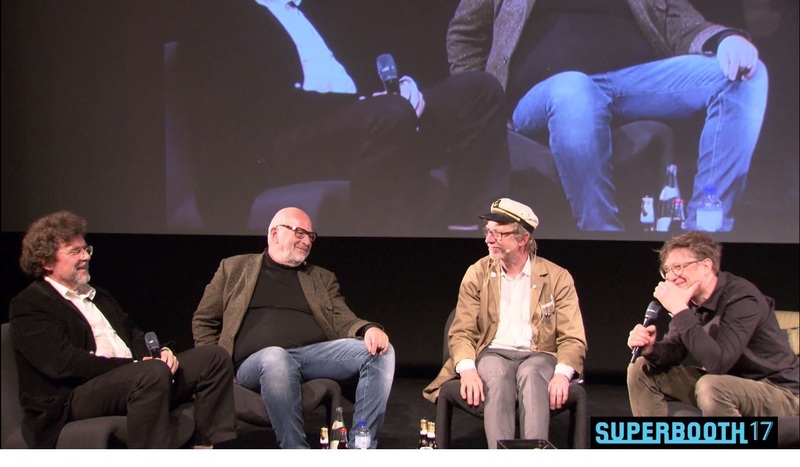 For this discussion Herr Schneider invited Moritz R (Der Plan), Daniel Miller (Mute Records) and Jan St. Werner (Mouse on Mars). Follow this entertaining talk about their favourite synthesizers, the early days of Depeche Mode and the art of opening beer bottles. 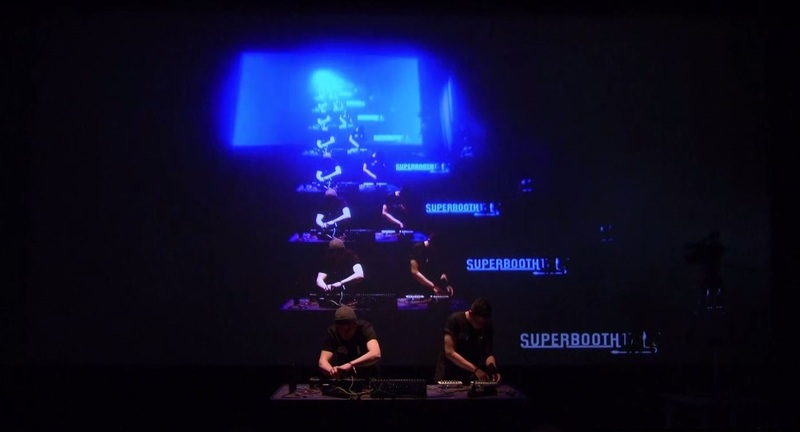 Skinnerbox with an energetic performance at SUPERBOOTH17. The Gesprächskonzert for Endorphin.es features their complete system Shuttle Control, a Minimoog and some software and controllers. 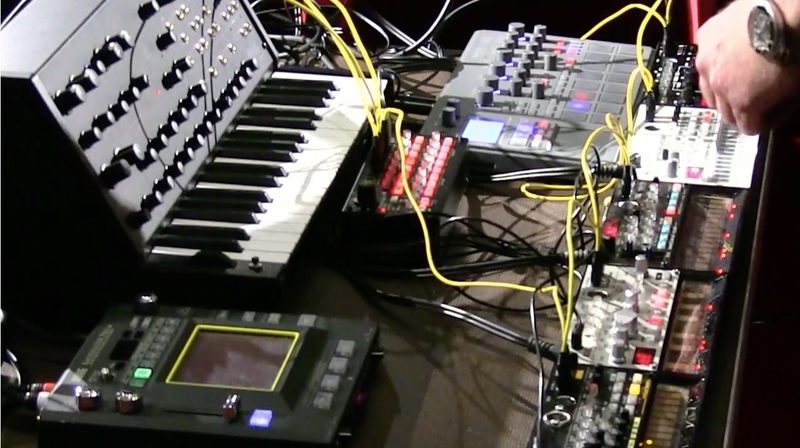 A nice example for the integration of modular synthesizers into a live setup! Enjoy the video. 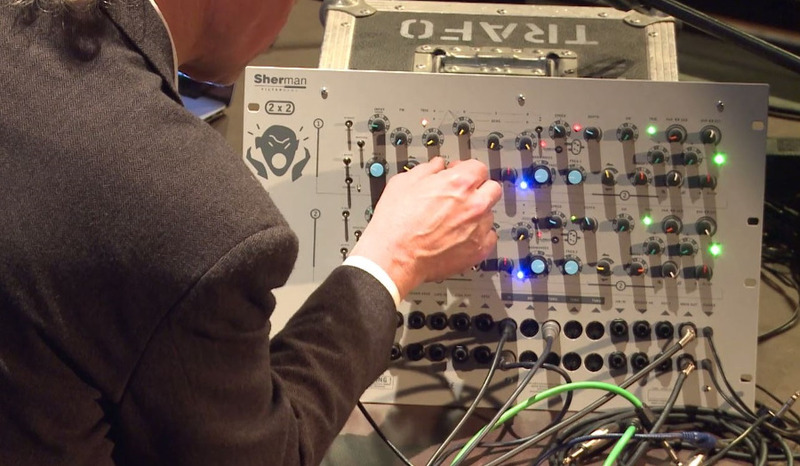 At SUPERBOOTH17 we were given a rare honour: Herman Gillis demonstrated his legendary Sherman Filterbank at SUPERBOOTH17. In 1996, the first prototypes of the Sherman Filterbank came out and the have been improved and updated constantly. This Gesprächskonzert is a good example for ‘how it could be done’ – a very nice product presentation tha really shows the possibilities of the handy MFB machines. Enjoy the video. 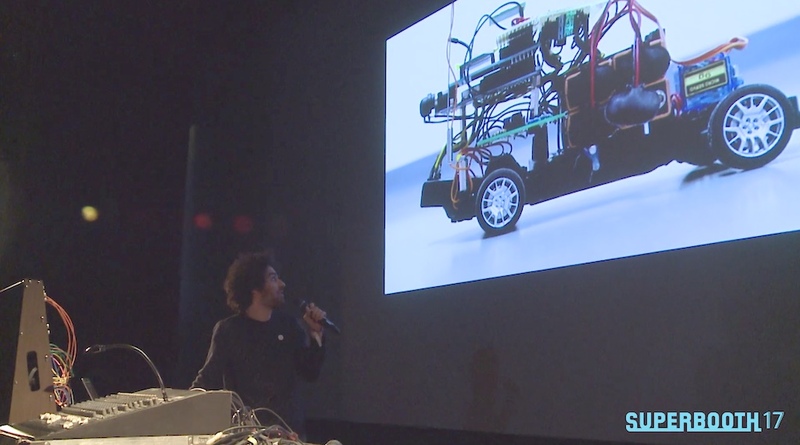 SUPERBOOTH is about meeting the makers, getting insights into the work of manufacturers and learning more about new products than their technical specifications. This Gesprächskonzert is a good example for many brands in eurorack, as many manufacturers have an artistic backround – get to know the mind behind ADDAC and find out what André Gonçalves was doing before inventing tons of intersting modules. After a concert at SUPERBOOTH17 Gino Rabair will return to the stage of SUPERBOOTH18, this time probably with his friend and band mate Tom Djll. Find out more in this video. 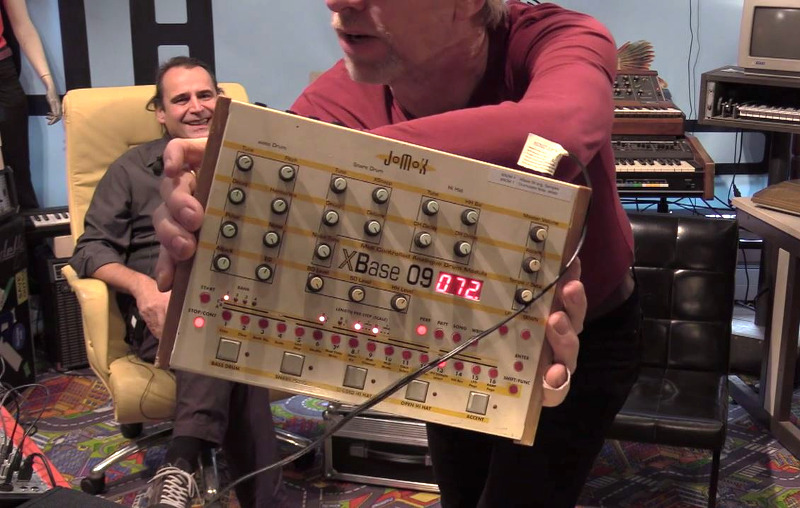 Jürgen Michaelis is building the famous Jomox drum machines for almost twenty years. In this video he and Herr Schneider are talking about the history of his company and show a little bit of what the Alpha Base is capable of. 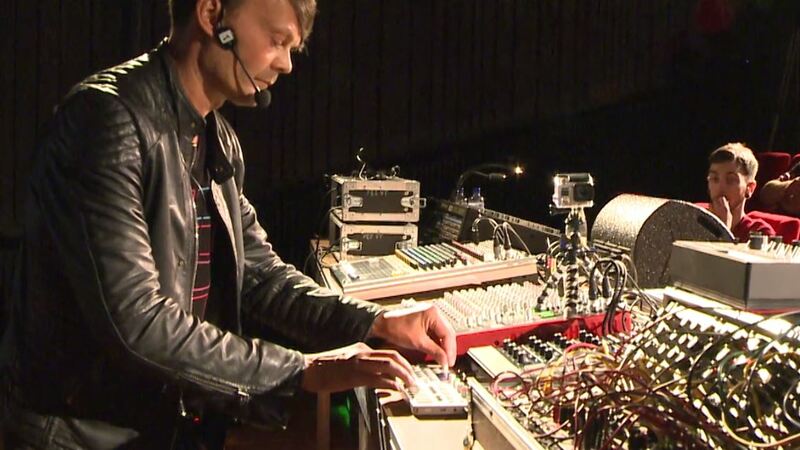 Also in this video: the wonderful concert of Panic Girl and Jericho on SUPERBOOTH17 and the gig of Jürgen himself with his AKASHA synth on Superbooth16. 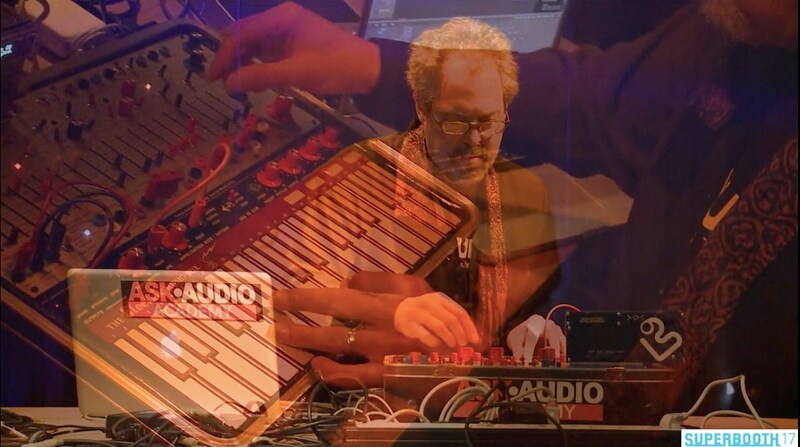 After having made a Gesprächskonzert without a concert part for Random*Source on SUPERBOOTH17 the american but berlin based artist Darrin Wiener is here to play some music. Introducing the pros of Banana and explaining the special Ideas by Serge we spent a good time here with a game on modulars that could be repeated on SUPERBOOTH18, we’ll see. 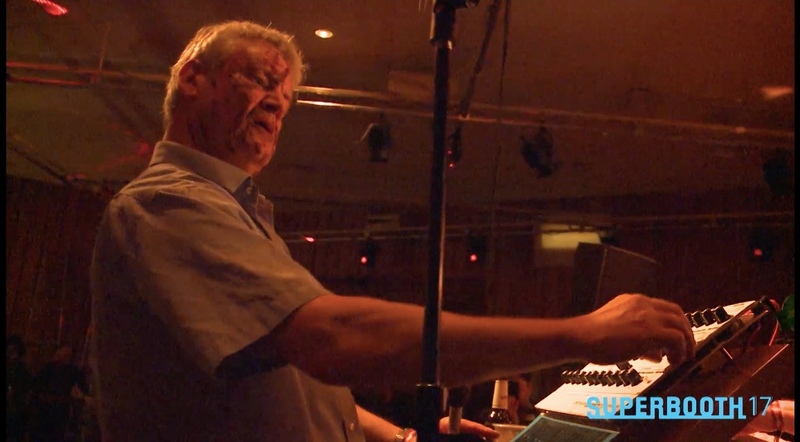 For roundabout 20 years already HerrSchneider is in touch with Schneider TM alias Dirk Dresselhaus – one half of DIE ANGEL – busy generating electronic music, installations and well respected concerts and records. After he played a live gig on the seaside stage at SUPERBOOTH17 the two are now talking about motivating Schneider TMs friends and partners for something bigger on SUPERBOOTH18, follow their conversation here, see a short cut of the session by Monika Werkstatt and the latest Videorelease by DIE ANGEL. The Ondomo is a very well made remake of the Hondes Martenot as invented in France roundabout 1930. In this video the instrument is introduced by a japanese “ondomist” playing examples and perfomring some nice atmospheric impressions on this monophonic instrument. It is showing very good what kind of an impact a simple melody can have when played on a real instrument. This is also a very good example on how to set up a so called “Gesprächskonzert” on the SUPERBOOTH to generate even more interest towards your products and visions. 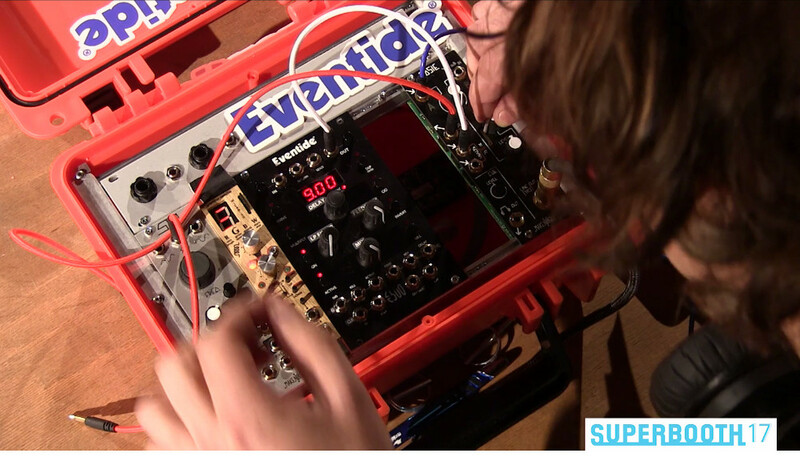 One of the three big global players for reverberations, the company Eventide introduced a eurorack modular solution and a good delay FX on SUPERBOOTH17 with a so called Gesprächskonzert. 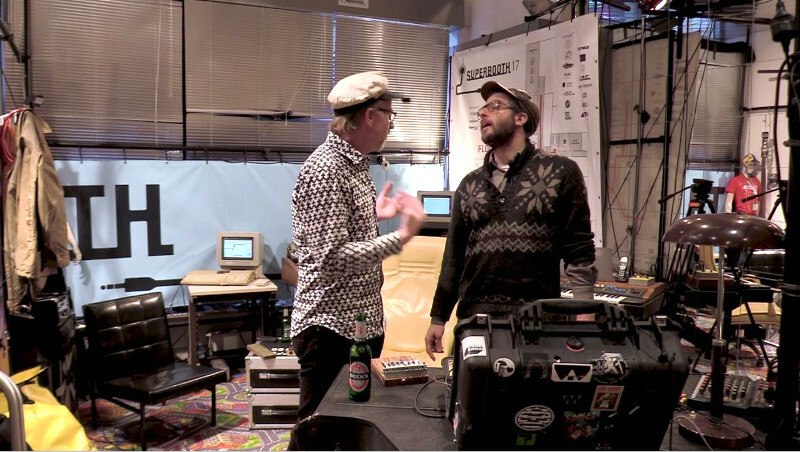 The introducing moderation of this video gives you an insight of the C-Base Berlin, that was an additional stage for artists like Robert Lowe and Dieter Doepfer this year, and will be again with SUPERBOOTH18 as Superbooths official aftershow venue. 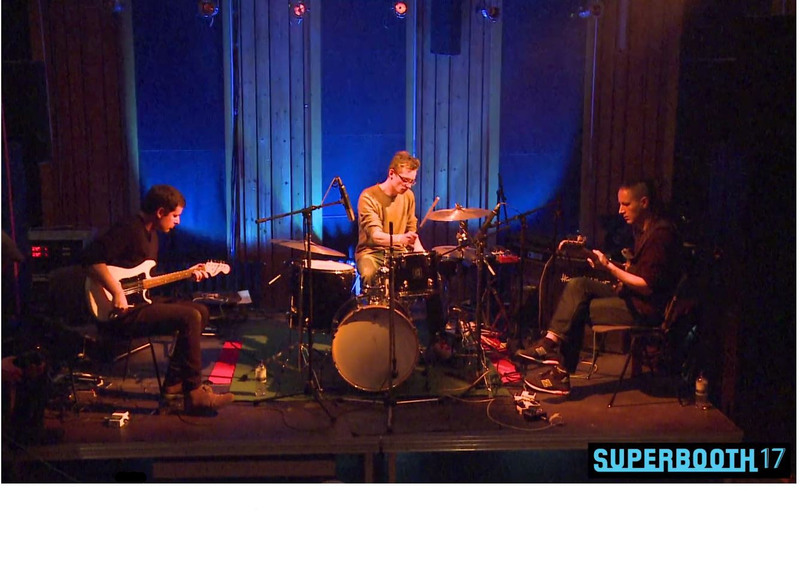 Mark Verbos and Matt Didemus played a performance on SUPERBOOTH17 here. 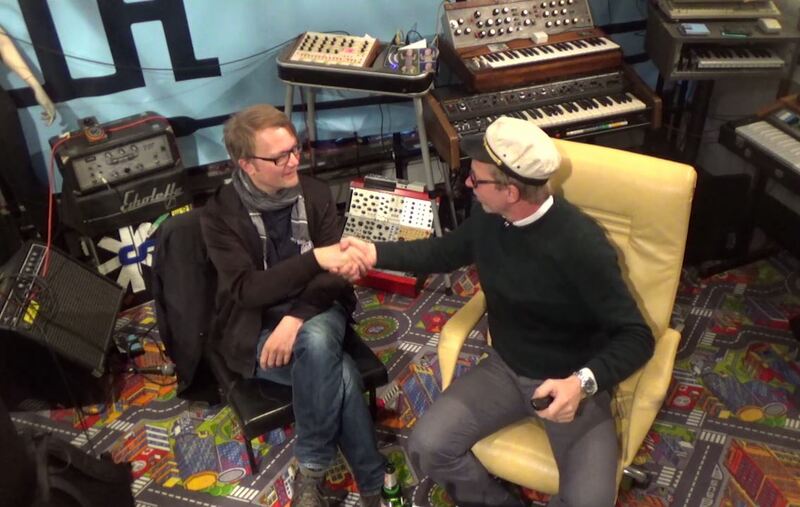 Both living in Berlin now visited Herr Schneider in his office for a chat where they recorded this interview. At the end of it you will see the performance Mark and Matt played live, before this we show you the brilliant Gesprächskonzert by Mark Verbos introducing his modular products to our great audience on Superbooth and to you. Please forgive us some cuts that we had to make towards dropouts and technical issues while recording. FuckeTybUcKetY MKIIII was giving a weird performance in the concerthall on this years Superbooth. The Band around Ken Macbeth playing two of his outstanding Elements Synthesizers was known as a rumour from the internet so far, having released some very few noisy recordings. 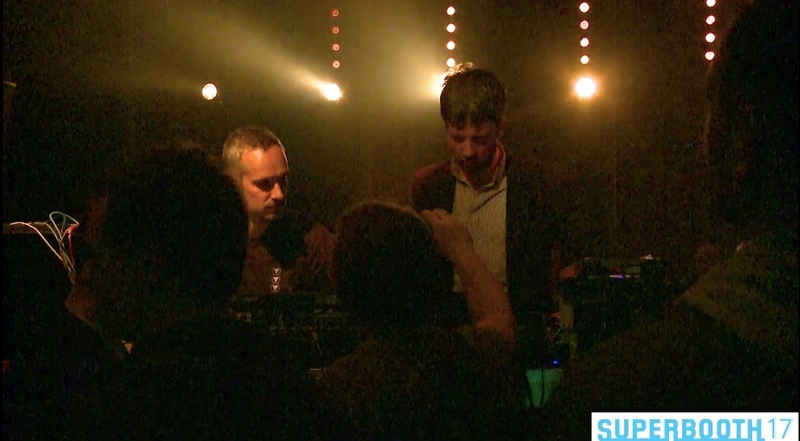 STROEME playing live on just two Doepfer A-100 systems recorded on Superbooth 2017 is the first release of a full concert from the Berlin based trade show for electronic music and instruments called SUPERBOOTH. More than 50 performances and product presentations will be introduced and explained on this channel introducing the 2018 show. 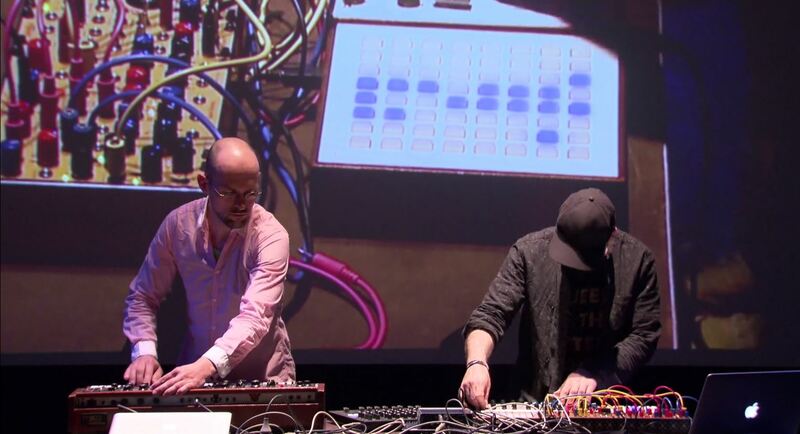 One of the uncounted real synth concerts and a really smart performance on SUPERBOOTH17 was the product presentation alias Gespraechskonzert for KORG in the Cinema. 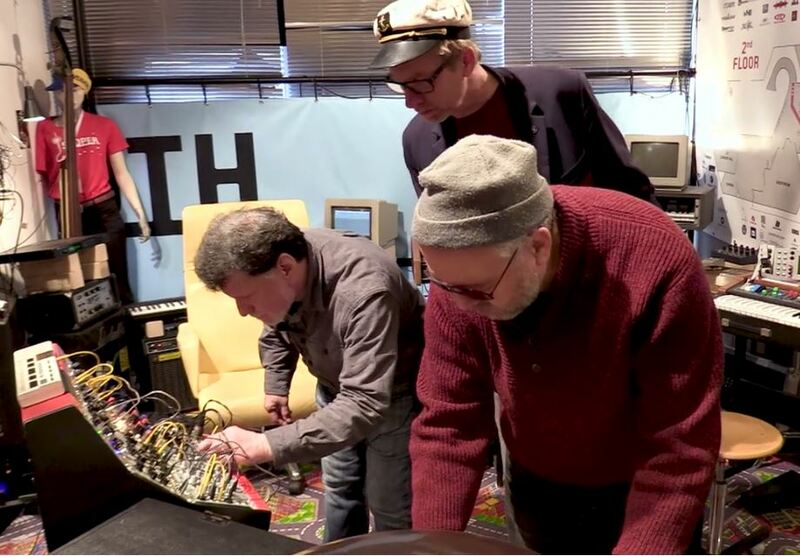 Jörg Sunderkötter – known as Sound&Recording’s earlier chief editor, here on the keyboards – and his studio partner Joker Nies – also an expert for circuit bending – had some problems to find on stage but then … turn it loud and see yourselves. 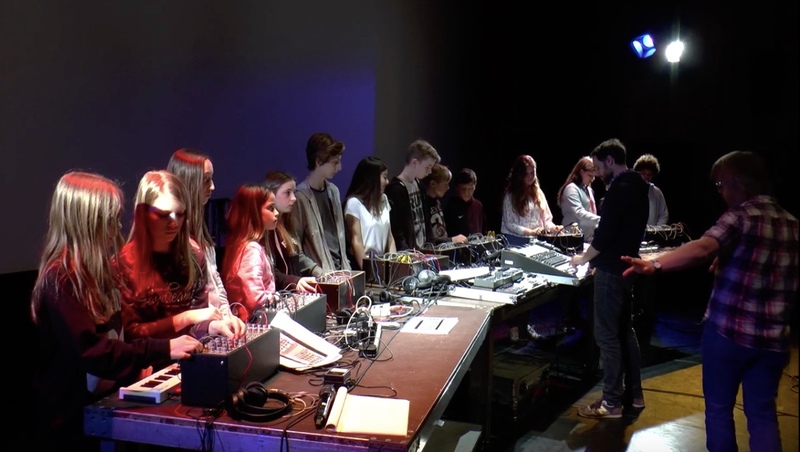 In order to make it easier for pupils, children and other adolescents to gain access to knowledge from the application of modular systems, the freelance artist Gammon from Vienna has developed a workshop for SUPERBOOTH17 for up to 18 participants. Here he comments on the results in a personal discussion with the event’s initiator. 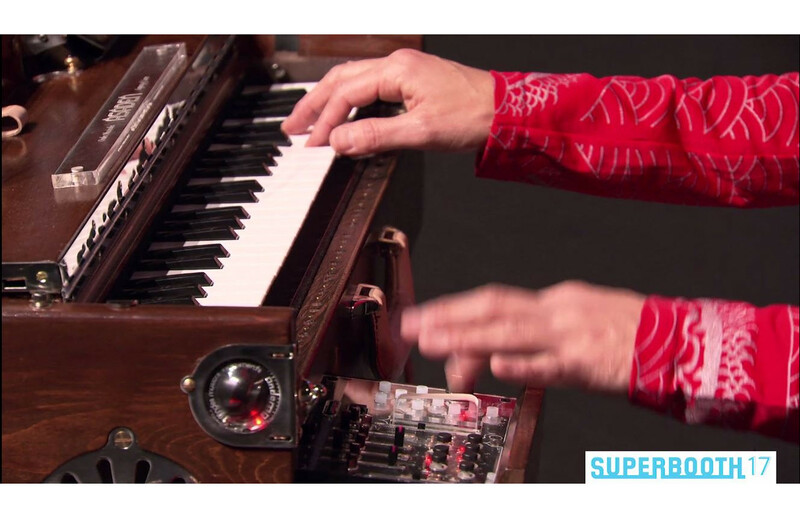 At Superbooth17 there were three concerts with Buchla Synthesizers and here we will show you the one by Steve H from Los Angeles who is an experienced musician and trainer for software (!) musical instruments btw. Introducing this Patrick Detampel is giving us a short insight to the prototypes of a System 100 clone series to be coming in very shortly by Catalyst Audio. Don Buchla was “the other” old boy of Synthesizers creating “systems in progress” that was not made to be used with keyboards or to play melodies on. Ken Macbeth was visiting us to review the very first gig with his outstanding band FucketYbUcKetY on SUPERBOOTH17. In the audience there was also Marco Haas alias shitkatapult alias T.Raumschmiere who stated out sponaneously that he will only play again on Superbooth if-then together with this guy. So I asked them both to visit me in my office to talk and we (..they) did. We had a good laugh and compared a lot of thoughts, looking forward to SUPERBOOTH18 already. Dan Snazzelle was on tour throughout europe introducing five new modules in Barcelona, Berlin, Netherlands and Czech Republic stopping over at SchneidersBuero to talk about the presentations on Superbooth. 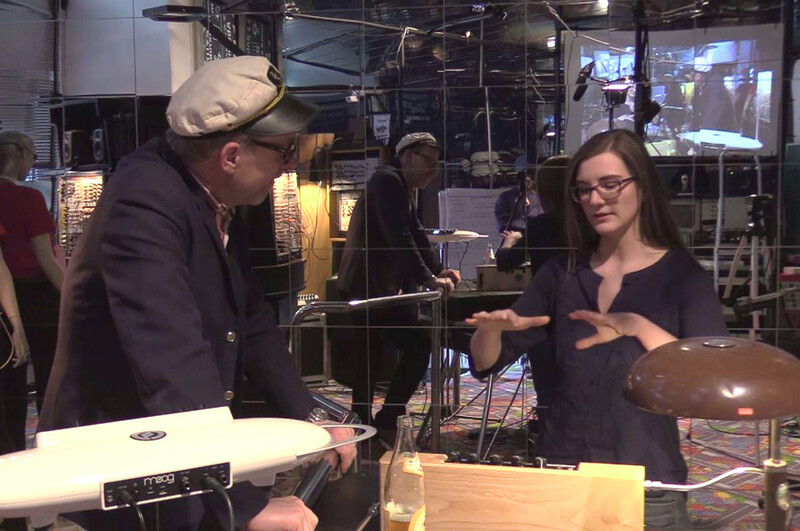 Before seeing his wonderful and charismatic Gesprächskonzert from 2016 at the end of this video, we interrupted our conversation with a little teaser for the one by Clifton Cameron in 2017 introducing the Analogue Systems Cabinet. Unfortunately this one has not been filmed from the beginning, so the concert part is missing.